In 1893, Georges de Montgomery, the son of Hilbert Compte de Pembroke de Montgomery, modified this sublime neoclassical demure, situated in a 10,000m² park. Le Mas d’Aréthuse – Roquebrune Cap Martin was, and still is, one of the most exquisite properties of the riviera. Due to the talent of Georges Tersling, the baptised Mas d’Aréthuse (from the famous huntress Artemis from Greek mythology, who had the same name as the opera that was written by Mr and Mrs Montgomery), possessed a façade framed with two pilasters in red marble and decorated with a triangle pediment. On the façade facing the sea, a rotunda with large openings separates by large pillars of red marble dominate over a large terrace in a semi circle shape. In addition to the seven suites, the villa was made up of a hall leading into the living room, a smoking room, another living room furnished with eight old Delauney signed Gobelins arm chairs which came from the Chateau de Versailles along with a table with sculptured wood, carrying medallions of Louis XV1 and Marie Antoinette. Two dining rooms, one of which is a summer dining room, the walls covered with ancient woodworks and on the boxed ceiling, with painted golden flames on a blue base, a library with one thousand five hundred volumes, along with a photography laboratory complete the ground floor. A diplomat in Brazil, in Belgium and also in Spain, Georges de Montgomery was very attached to France. He should have taken a French nationality and fought in the French troops during the war in 1870. Elizabeth d’Autriche came on several occasions to walk in the property’s park, which was surrounded by cactus plants, palm trees and sisal plants, with Madame Montgomery, who was a poet, musician and decorator. Originally from Scotland, Lucy de Montgomery was the great grand daughter of the Swedish miniaturist Hall and the grand daughter of the baron Michaux, chief general of the First Empire, arms companion of Bernadotte. Very close to the empress, she composes Ode à l’imératrice d’Autrische engraved later on the monument in her memory on the Cap Martin, following her murder by an anarchist in 1897. Georges de Montgomery did not have much leisure time in his Azurienne villa he disappeared, prematurely in 1900. His widow no longer lives in the Mas d’Aréthuse, as she prefers to reside in her Venetian palace, Semitecolo. In tribute to her disappeared widow, she writes homage, names immortalié which had great success in Italy and obtained from the Italian press the golden award for literature. Lucy de Montgomery rented the Mas d’Aréthuse for several years to the Princess Ouroussoff, the wife of the Russian ambassador of Paris, before putting it up for sale. The demure was then bought by the Prince Danilo de Montenegro who was due to become the King of Montenegro, but was stopped due to the attachment to the small kingdom of Serbia. 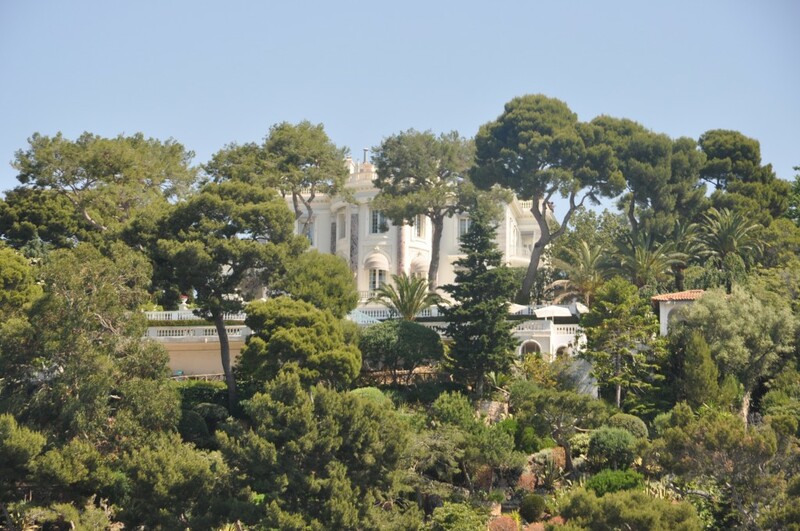 This owner renames the villa “Augusta” and resides here until 1924, before installing himself in the villa Torreca in the hills of Roquebrune. The villa was bought again, by the British press magnet and president of the Associated Newspapers Limited, Sir Pomeroy Burton, who re baptised the “Villa Barbara”. Member of the Golf Clun Mont-Agel, he keeps the property for several years before building the Chateau de la Croë on the Cap d’Antibes. After the property was named “Pompadour” in the 1950s, the old Mas d’Aréthuse is today called the Villa Trianon, has conserved its original aspect. What is a street address of this beatifull villa?